Separation anxiety can make a doggy destroy the place in your absence. It's nice to be missed, but it's not so nice coming home to overturned fixtures and chewed up furniture. If your pooch misbehaves while you're gone, she probably suffers from a moderate to severe case of separation anxiety. Talk to your vet about appropriate steps to fix this problem. Your furry friend's misbehavior stems from an anxiety disorder. She's not being spiteful, lashing out at you for leaving her or lacking training; she's simply panicking when alone. Nobody knows exactly why some doggies suffer from separation anxiety, but it's not uncommon. It's more likely if your pooch is unaccustomed to being left alone, recently lost a companion or family member, experienced a trauma or she's trying to cope with major environmental or schedule changes. Don't panic yourself -- take a deep breath and get in touch with your vet to work out a treatment plan. Separation anxiety is pretty easy to spot. 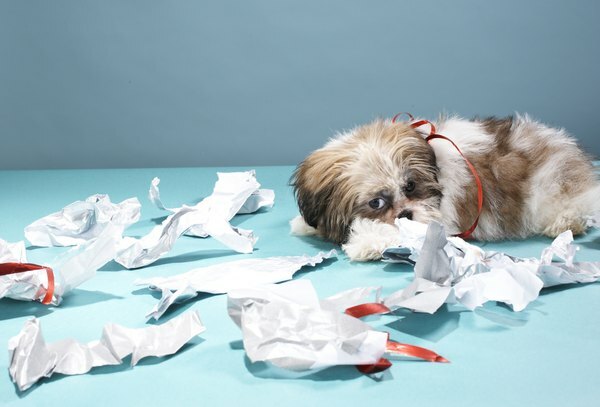 If your pooch's misbehavior while you're out involves inappropriate urination or defecation, destructive chewing, knocking things over and making a mess, scratching up the doors or window panes, howling and making other generally unpleasant sounds or digging up the yard, it's telling. If your doggy also often follows you around from room to room, freaks out when you're preparing to go out and when you come back or gets obviously depressed as you leave, this is further evidence of separation anxiety. Work with your vet to devise a solid plan to help your four-legged friend overcome separation anxiety. Acclimate your doggy to your absence by leaving briefly at first and gradually staying out longer. Spend quality time with your dog before departing for extended periods, taking her for a walk or romping around the yard so she'll have less energy when she's unsupervised. Don't fuss over your pooch when you leave and return, just keep goodbyes and hellos simple. Also, leave your pooch lots of toys for distraction and an item of clothing with your scent while you're gone. Until the situation is remedied, your vet might suggest anti-anxiety medications, supplements or products, and you should consider a pet sitter or doggie daycare program. Scolding and punishment are useless. Dogs don't generally respond to these, plus your pet doesn't associate earlier behavior with a negative response. Yelling and punishment usually just worsen stress and anxiety-related problems. Remember, separation anxiety is a psychological disorder, not nastiness or disobedience. Obedience training won't correct this problem, nor will leaving the TV or radio on while you're gone or getting another dog. Additional pets don't usually help because it's separation from you that triggers panic, not loneliness, per se. Crating your doggy when you go out may stop the misbehavior, but it's a terrible fix for separation anxiety; it just exacerbates stress and can lead to injuries if your pet goes nuts while confined. What Kinds of Medical Problems Does a Pixie-Bob Cat Have?